It wouldn’t be a watch without the ability to tell the time precisely. It works in conjunction with your iPhone to keep time within 50 milliseconds of the global time standard. You can also customize the watch face so it tells you everything you need to know, keeping it relevant to your life and schedule. As it’s on your wrist, you’re always connected via the Apple Watch. It can add a physical dimension to alerts so you’ll always be kept in the loop and you’ll never miss an important notification ever again. You can connect with friends in various different ways from the standard messages and calls to some fun news ways too. Sketch a picture or message to your friends, who can then watch it animate in real-time, or simply tap to let someone know you’re thinking of them. They’ll feel it on the wrist. You can also send your heartbeat to people, simply tap two fingers on the screen to let someone know how you really feel about them. 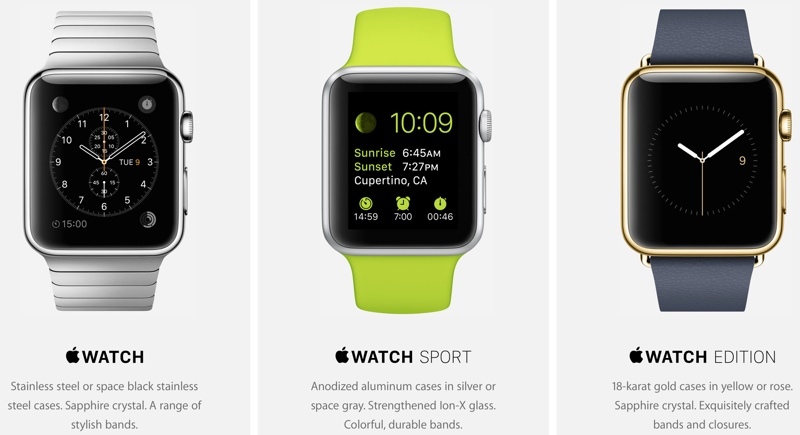 The Apple Watch takes getting fit to a whole new level. You’ll be able to see your daily activity to help you move more, sit less and start being healthier. Not only will you be able to track what you’re doing but the Apple Watch will learn your fitness levels and will remind you when you need to move. This isn’t just some blank and boring smartwatch, the Apple Watch looks just like the watch of your dreams with a beautiful touchscreen face. Choose the style and colour that suits you and your own personal style.